← Dunmanway Children’s Holiday Club Runs with Big Top’ Theme Too! 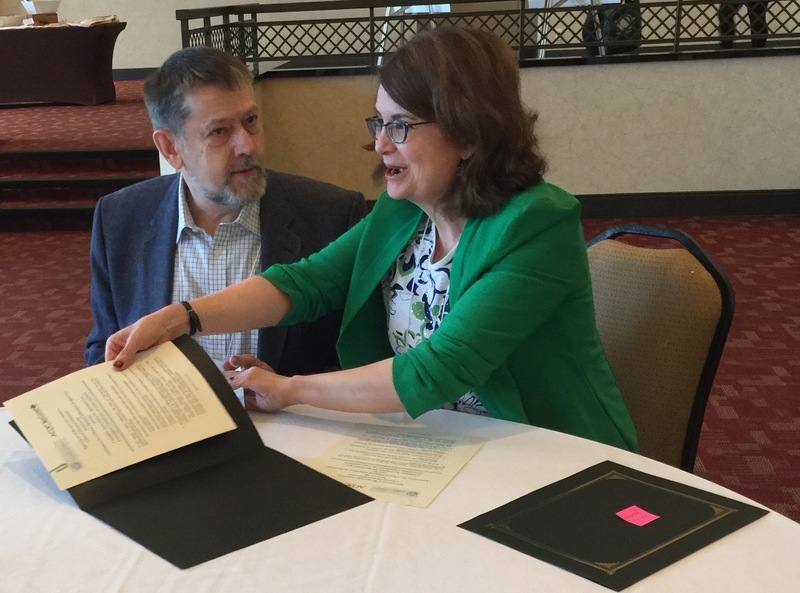 Earlier this year, ACPE (Ireland) Ltd, the professional Multi Faith body for Healthcare Chaplaincy training, together with CASC (Canadian Association for Spiritual Care) formally signed an Agreement of Reciprocity at the CASC Conference at Deerhurst Resort, Ontario. The President of CASC, the Rev Elaine Nagy and Chairperson of ACPE (Ireland) the Rev Bruce Pierce (Director of Education Northridge House at St Luke’s Charity, Cork) signed this innovative agreement on behalf of their respective bodies. The Accord will facilitate an interchange between Irish and Canadian students and supervisors and is the first intercontinental agreement of its kind. This entry was posted in Announcements, Chaplaincies, Clinical Pastoral Education, Continuing Ministerial Education, Diocese, Healthcare Ministry, Northridge House Education and Research Centre, Saint Luke's Charity. Bookmark the permalink.